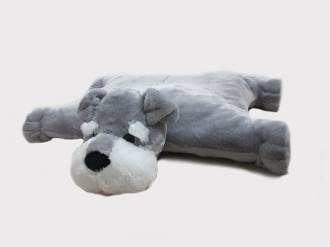 Your child will love to snuggle up to this ultra-soft Pillow Chums which converts into a large 40in cuddly pillow. Each animal have adorable whimsical features with novelty eyes. Child safe double Velcro for secure closure so it stands as a plush toy and can be tucked away in a childs room then open up to a pillow to provide support and comfort. * Ages: 3 years and up * Use a cloth or sponge with lukewarm water and mild detergent. Rub your Pillow Chum clean. Allow to air dry and brush gently. * Primary composition: 100% polyester * * CPSIA Certified * Made in China.